A selection of this week's new and used items available around the internet. Though it has been over 20 years since they were discontinued, WWF ice cream bars are still an object of desire and fascination for fans who are old enough to remember them. CM Punk even pushed for their return in a series of promos in 2011. More recently, there was a great buzz about the potential return of the product when The New Day began to tease their New Day Pops, which ultimately ended up being their spin on an Otter Pop, and not the vanilla treat we look back on so dearly. 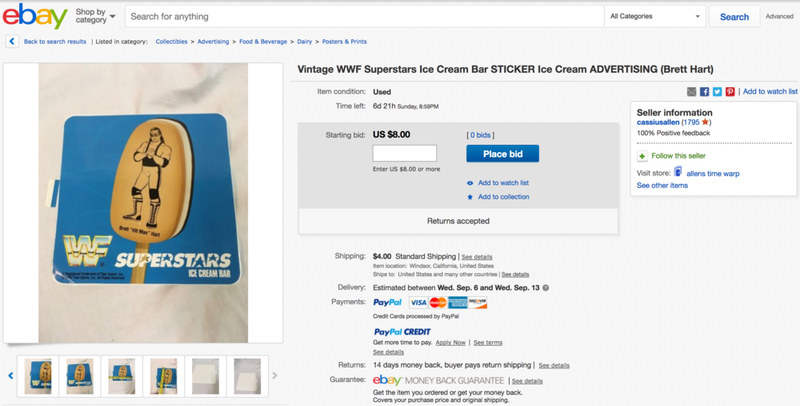 For those who are feeling extra nostalgic, eBay user cassiusallen has unearthed a true rarity: the decal that ice cream trucks would display to let you know they were serving the bars. This will tide you over until Chalkline releases their ice cream bar themed jacket in the Fall. The "Nature Boy" Ric Flair, who has made mainstream headlines recently for a serious hospital visit (and has turned the corner and is reported to be on his way to recovery), has had no shortage of killer merch throughout his career. 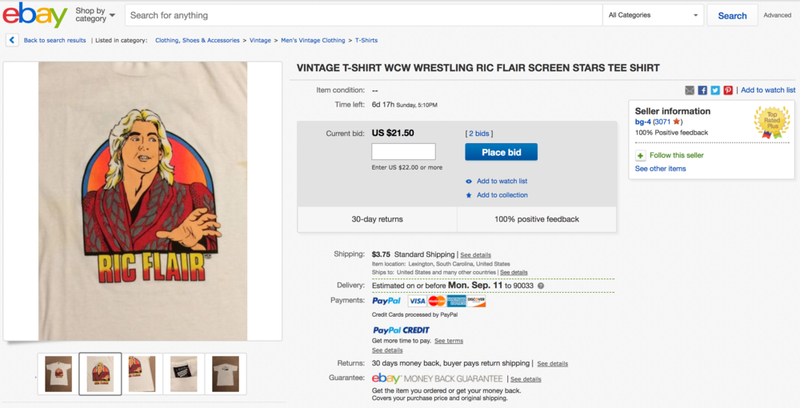 This shirt from his WCW days, for sale on eBay by user bg-4, is definitely one of the less common pieces, and should be on any wantlist after seeing that beautiful screenprint. This one is printed on a classic Screen Stars tag, and has the logo for Columbia, SC CBS affiliate WLTX on the back to let you know where you can catch the next appearance of the man himself. Another listing on eBay, this time as a Buy It Now by user 1903brett: An official XFL junior size football made by Spalding, brand new in the original package. This one speaks for itself, and comes at a better asking price than you usually come across. 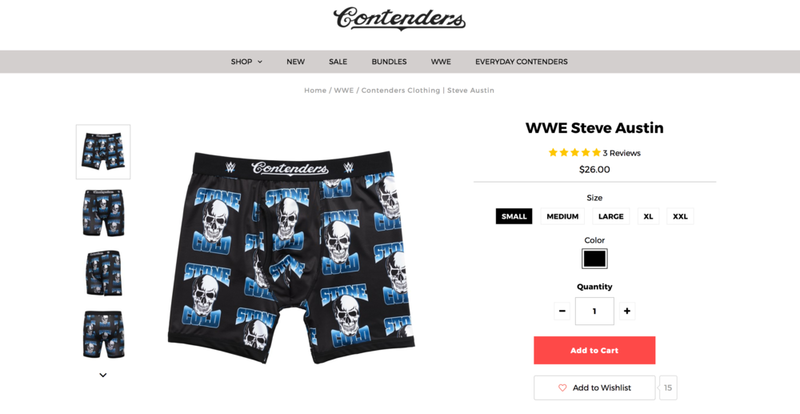 Keeping up with their theme of unusual branding partnerships, WWE has paired up with underwear company Contenders for a line of Superstar-themed boxer briefs. Typically found only in the kids section, these are actually adult sized. This is one of those moments where you know shouldn't, but it's almost too ridiculous and strange to pass up. Aside from this Stone Cold design, you can also rep AJ Styles, The New Day, Seth Rollins, Dean Ambrose, and more on your private bits. All pairs come packaged with a "limited edition WWE collector's card," whatever that means. The scope of the wrestling craze during the 90s boom is perhaps best understood when you take a look at how deep the merchandising game was at the time. Not only did WCW have their own branded race car, it also had its own scale model that you could purchase and put together at home. This #29 Monte Carlo, driven in NASCAR by Steve Grissom in 1996, can be yours in model form for only $8, thanks to Etsy seller Crochet2Cherish4You.